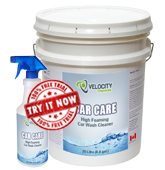 CAR CARE is a very high-foaming liquid car wash that removes road film, dirt, dust, and light oils and grease from the exterior of vehicles. Intended for use in automatic car washes but may also be applied by brush or through a power washer. Commonly used by car dealerships, detail shops, rental car agencies and others who require the exterior of cars or buses to be cleaned. Use at 1% to 2% concentrations or approximately 1.5 oz. to 2.5 oz. per US gallon of cold or warm water. Solution may be applied by automatic car wash, brushed on manually, and via pressure washing.